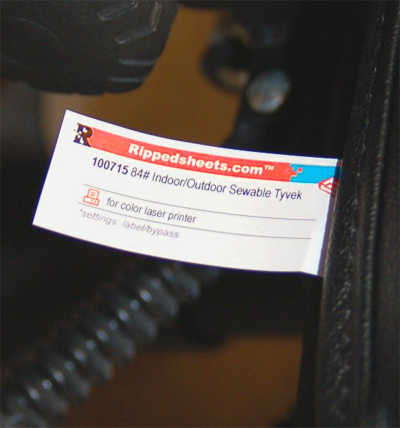 This is a premium white Tyvek non-adhesive sheet, matte coated, and only one side for laser printing. It is electronic image capable in fast feed bond mode through single fuser lasers including color lasers. It has also been certified by RIT to run on HP Indigo ws4000 series presses. This 100715 has been updated for outdoor and waterproof use, with all the well-known advantages of Tyvek including sewability. This Tyvek material will serve multiple needs of those looking for a Tyvek grade that will get through a color laser. Caliper is .011″. If you are looking for a non-printable 6.3 mil Tyvek, please Contact us about die cutting our non-printable 203011. Price is the same as 100715. Price includes micro nikking sheets with any shape or size tag in 48 hours. Tyvek® is a continuous fiber form of high-density polyethylene composed of carbon and hydrogen. This Tyvek is coated on ONE SIDE with a latex layer that makes it compatible with offset, screen, flexographic, lithographic and laser printing. This material can be sewn and stitched. It stands up well to folding, diecutting, perforating and punching. Applications: Tyvek can be used for a wide range of applications that require durability and print including: maps, books, tags, banners, coupons, price cards, picking tickets, runners' numbers, military manuals, labels, upholstery tags, furniture tags, mattress tags, tent tags, canvas tags, and other sewable tags. The above are typical technical values and are given in good faith based upon ourmost up to date knowledge and experience. As the products are used outside our control we cannot take responsibility for any damage that may be caused using the product.In every case, user shall determine before using any product in full scale production, or in any way, whether such product is suitable for user's intended use for their particular purpose under their own operating conditions. DupontTM and Tyvek® are trademarks or registered trademarks of E I du Pont de Nemours & Co or its affililiates. All rights reserved. Rippedsheets.com is not affiliated in any way with these companies.